From Canon’s highly successful range of PowerShot A-series digital cameras, comes the A2300 point and shoot camera. This highly capable mid-level digital camera with an array of significant features and functions makes an ideal pick for hobbyists and beginners looking to explore the basic techniques in digital photography. This A-series PowerShot camera from Canon features a 28 mm wide angle lens and a focal length of 5 mm to 25 mm or a 35 mm equivalent of 28 mm to 140 mm. This wide angle lens has a 5x optical zoom with the availability of 4x digital zoom, which combine to give the camera a whooping 20x of zooming ability. 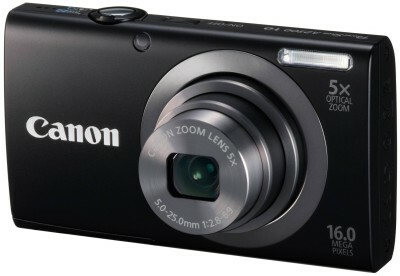 The CCD sensor on this Canon PowerShot allows the user to capture images at an incredibly high 16 megapixel resolution. The PowerShot A2300 features a body design that weighs in at a very modest 125 g which includes the battery and memory card. The compact size, strong build and light weight components provide the A2300 with increased durability and portability. The back panel of the A2300 houses a 2.7 inch wide angle TFT colour display with 5 levels of brightness adjustment levels for increased customization. This LCD screen has a display resolution of 230,000 dots with an aspect ratio of 4:3. The 16 megapixel camera when combined with Canon’s highly advanced Digic 4 processor makes it possible for the PowerShot A2300 to record HD video at a resolution of 1280 x 720 at 25 frames per second. Battery and Storage The advent of an NB-11L rechargeable lithium-ion battery powers the Canon A2300 for up to 210 shots on full charge. All the recorded video and captured images are stored in the camera’s recording media which is in the form of an SD, SDHC or SDXC memory card. These saved files on the memory card can easily be transferred to a PC or a laptop via the camera’s high-speed USB 2.0 port, which is compatible with latest versions of Windows and Mac operating systems. This Canon PowerShot camera features monaural audio output and an analog video output function that is capable of transmitting both PAL and NTSC signals. Performance The A2300 from Canon has a circular aperture control that helps the user to control the amount of light passing through the camera’s lens. The aperture range on this camera ranges from f/2.8 to f/7.9 (Wide) and from f/6.9 to f/20 (Tele), giving you high quality images even under poor or insufficient lighting. The TTL or through the lens autofocus system on this PowerShot camera sports a range that starts from 3 cm (Wide) and 1.2 m (Tele) to infinity in the normal mode. It also has a macro focusing range of 3 cm to 60 cm. The light sensitivity of this camera ranges from ISO 100 to 1600 giving you clear images irrespective of the available lighting conditions. The A2300 also features a wide range of adjustable shutter speeds from a maximum 1/2000 sec to a minimum of 15 sec. A built-in flash with auto and manual adjustment modes lets you control the intensity of the flash, within the available flash range of 50 cm to 3.0 m (Wide) and 1.0 to 2.0 m (Tele). Features The Canon A2300 comes with an assortment of white balancing and shooting modes with Red Eye Reduction and Face Detection technology, which together help in achieving the best result in very specific situations or conditions. The camera also uses a digital image stabilizer to makes sure that the captured images and videos are sharp and shake free. The PowerShot camera further comes enabled with PictBridge technology that allows you to connect the camera directly to a printer without a PC, enabling easy direct photo printing. The Canon A2300’s self-timer function works on a 2 or 10 sec delay, giving the photographer enough time to be part of the image. The continuous mode is an advanced feature that allows the A2300 to take a series of shots in quick succession. In the Program mode, this Canon camera is capable of 0.8 shots per second and when on the low light mode, can take up to 2.8 shots per second, making the camera perfectly suited for all possible scenarios..The product Canon PowerShot A2300 Point & Shoot Camera is from the famous brand Canon. The product is currently available with the amazing discount from FlipKart.Currently a discount of 5.0% available for this product. Great discount for this product which has the original price of Rs.5495.0 and you get these amazing products for a discounted price of Rs.5220.0. Hurry up. Stock may be limited.